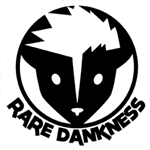 Rare Dankness was founded in 2010 after many years of growing, collecting, preserving, and experimenting with many varieties of Cannabis. Through their global network of friends, Rare Dankness has been able to work with some of the most sought after and highly coveted genetics. RD\'s collection of genetics spans the last three decades and represents the finest specimens of Cannabis strains in the world. Their work is not meant to replicate the \"mothers\", but to compliment the genetics by breeding with superior males.